When we set out on our tour of Hampi, all I wanted to see was the place – I had heard so much about it, and was excited, in spite of knowing the fact that most structures were in ruins. My knowledge of history however was sketchy (never having paid much attention to it in school, of course!) and didn’t do much reading up before I went. That turned out to be a mistake, since I was bombarded by questions from Samhith ! Questions I had no answers to – the right ones at least! Of course, he was more interested in learning which king killed whom and who broke the temples, and what treasures he took away from there – all, the sort of questions I wanted to distract him from. And the only way to do that was to read up on history and answer his questions correctly. Of course, considering that Hampi is a world heritage site, books were easy to come by. The ASI guidebook alone was enough to begin with, and we both read it through, learning a lot of interesting things we hadn’t known before. I know that many of you wouldn’t really be interested in history, but I still would encourage you to at least skim through it – who knows, like us, you might find something of interest. In any case, the reason I am writing this down is because I realized when I began writing about Hampi that there is so much more to it than just ruins, and the beauty and the importance of the place lies in its history, and its journey from being a stretch of uninhabited land to the capital of one of the richest kingdoms in India, to once again becoming a neglected area forgotten for generations. The story of Hampi began with the rise of the Kings of Kampili, in the early 14th century, when they ruled over parts of modern Anantapur, Chitradurga, Shimoga, Raichur, Dharwar and Bellary districts. The kingdom was attacked repeatedly and finally captured in 1326/27 by Muhammad-bin-Tughluq, who had captured the neighbouring kingdom of Devgiri, which he had renamed ‘Daulatabad’. Among the scores taken as prisoners were two brothers, Harihara and Bukka, who had been officers in the treasury of the Kampila regime. They swore allegiance to the sultan, and were sent back to their kingdom to subdue some rebels. The brothers happily returned to Kampili, threw off their allegiance to Delhi, and set up a kingdom of their own! 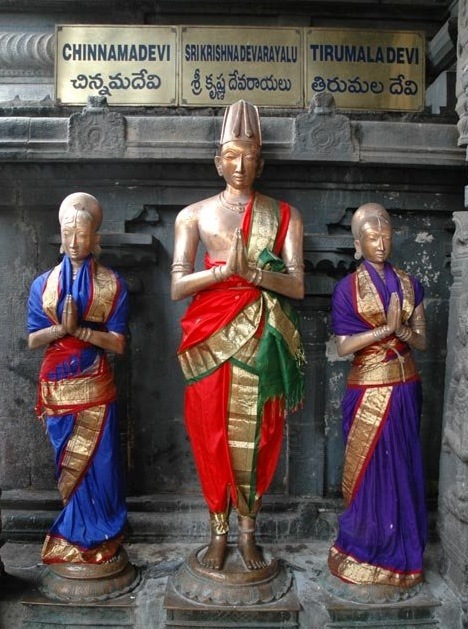 Harihara, ably aided by his brother Bukka, and advised by the sage Vidyaranya of the Sringeri Math, soon built a kingdom stretching from the eastern coast (present day Andhra) to the western coast (present day Karnataka). As capital of their kingdom, they chose to build a new city on the southern banks of the Tungabhadra, opposite the older fortress of Anegundi. The new city came to be known as Vijayanagara – the city of victory. However, the city is also sometimes referred to, as Vidyanagara, named after the sage who conceptualized it. The brothers, being the sons of Sangama, came to be the forbearers of the Sangama Dynasty, and chose as their heraldic crest, a boar, representing the third avatar or incarnation of Lord Vishnu (Varaha Avatar). However, their patron deity was Lord Shiva as Virupaksha – the Lord of the world. The Vijayanagara Empire grew with the Sangama Dynasty, each successive ruler leaving his mark on the kingdom’s fortunes. While Harihara and Bukka laid down the foundations for the efficient administrative systems, Bukka is credited with laying the foundations of a brilliant irrigation system, traces of which are left even today, and inspire awe and admiration among tourists. Under the reign of Bukka’s sons, the empire grew powerful enough to overthrow the Muslim rulers of Madurai and establish Hindu rule over the southern part of India. They even sent emissaries to China! Such was the growth of the empire that foreign visitors sang paeans about the beauty and richness of Vijayanagar. All good things come to an end, and this period of growth was followed by one of stagnation, with a few weak kings, and the Sangamas were replaced by the Saluvas. These were then followed by the Tuluvas, who had been generals under the former regime. Again, the wheel of fortune turned, and Vijayanagar was blessed with the king who would be remembered forever – Krishnadevaraya – who would leave an indelible mark on the city, and indeed history, though he ruled for less than 20 years! It was he who re-established supremacy over south India, subdued the Bahamani Sultans, and re-captured Orissa. Not only was he an efficient ruler, who set the standard for perfect governance, he was also an accomplished scholar and poet, whose works figure among the best among the literature of his era. His poem on the characteristics on an ideal monarch and the principles of political administration is admired by scholars even today! Most of the architecture of that period owes much to him, since he made magnificent gifts to temples (prominent among which is the present temple at Tirupati). He embellished his capital too with great temples, and renovated those already present. He also built a number of new cities, and in general, was an epitome of the ideal ruler. Unfortunately, his life was short, and his death led to the decline of the empire, which never recovered. As brothers and brothers–in-law fought amongst themselves, the muslim rulers flanking the empire on all sides closed ranks and attacked in 1565. While the king was killed, the regent was taken away to safety, but the confusion and the complete rout of the army left the capital undefended, and the city was systematically and ruthlessly destroyed by the invaders. While the city changed hands again and again over the next hundreds of years, the once great capital city never lifted its head again, until the archaeological survey of India (incidentally, this was set up the British in 1861) began re-discovering the city buried under the rubble and farmland. 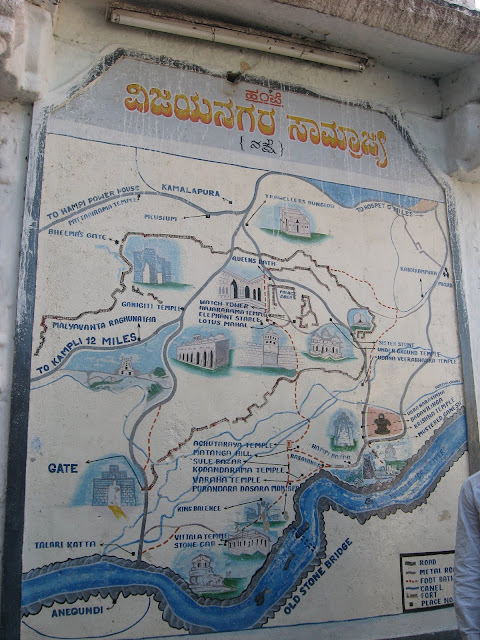 This then, is the story of Hampi….. Something which I believe we should know about, before we start exploring the city itself. Excellent reviews on Hampi. Very useful. Thanks for this post. Really appreciate it. Amazingly explained Vijayanagara Empire History in short and to the point. Perfect for someone like me who is reading about their coinage on websites like Mintage World. Thanks a lot for posting this information, very helpful indeed!